Even though Staniel Cay isn’t our favorite place to be in The Bahamas, we seem to end up spending time there. 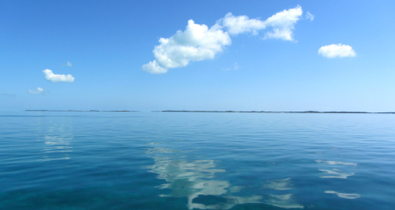 We were anchored in Big Majors until the wind turned to the north and then we went to the other side of Fowl Cay where we were anchored in totally calm water with three other sail boats. We were in Staniel Cay for one and a half weeks this time, mainly for shore facilities, good Internet and reliable phone service. Mark was able to do some boat work, but we are glad to be on our way again. For the next two days we won’t have Internet because we’ll be back in Exuma Land and Sea Park for one day and the next day we will be crossing the Exuma Sound to Eleuthera. Once in Eleuthera Internet and phone should be available again. This is important because our boat insurance is due May 15 and we still have phone calls, email messages, a contract and a check to send them. While cruising, the Internet is not just used for communicating with friends and family, but in reality we do all of our banking, check our mail held at our mail forwarding service. pay bills, and get weather reports. Most recently Mark did his taxes online. Google is our friend here when something happens and we need to get information. For example, when Daisy became incontinent a few weeks ago, we searched her symptoms online, found out it was most likely a bladder infection, read what antibiotic she needed, looked in her first aid kit and found it there. She is symptom free now but we would have had to go to Nassau to see a vet without this online assistance. The only veterinarians in The Exumas and Eleuthera fly in to the larger towns on no particular schedule. While in Staniel Cay we hunkered down expecting squalls while a front came from the East Coast to the Bahamas, but the weather never got as bad as predicted. However, it did limit moving around, so we were glad to be in a place that was safe and also had shore services. Before we left we filled up the diesel tanks and shopped at the grocery stores. This morning we called Mack Sails in Stuart, Fl and confirmed our intent to unstep the mast and store it and the sails with them for hurricane season. While it is expensive to call the States using our Bahamas phone, in situations like this it is worth it to get immediate information, rather than wait for email responses. As can be seen from the photo above, the seas were very calm today as we motored to Cambridge Cay. When we got to there the conditions were perfect for snorkeling near Conch Cut, which is probably one of the best places we have snorkeled in The Bahamas. Usually we would have to hold on to a floating rope tied to the dinghy due to strong current. Today we were able to snorkel around the area and then move to dinghy to another coral reef. We also snorkeled in and around Rocky Dundas and The Aquarium. The best thing about Rocky Dundas is the HUGE Elk Horn coral near the entrance. 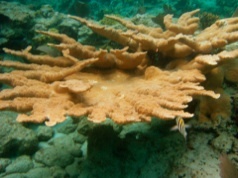 Each coral is over six feet long, as can be seen from the average size fish in the lower right hand corner of the photo. The Aquarium is a large area of coral with a deep circular shape. There are numerous types of tropical fish there, swimming all around snorkelers. It is protected and very calm so you can float perfectly still above the coral and watch the various fish swimming below. We will only be at Cambridge Cay for one day before going to Eleuthera tomorrow. For the last week, until yesterday, the weather was windy with some squalls passing through and the mooring field and anchorage at Cambridge Cay was full. When we arrived today it was empty. We were all alone. The forecast for the next few days is for light and variable winds so we hope we have enough wind to at least motorsail tomorrow. 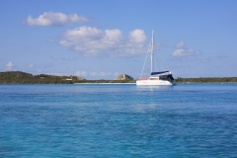 We will spend about two weeks in Eleuthera and then will head back to the States. Last time we sailed from Spanish Wells at the northern end of Eleuthera to Ft. Lauderdale with stops in Nassau and Cat Cay. Then we had to go back up the coast to Charleston. This time once we get to Bimini or Cat Cay (very close to Bimini) we will have one day to get to Lake Worth/Palm Beach. We’ll probably be in Lake Worth for several days while we have the mast unstepped at Cracker Boy Boatyard. From there we have a short motor up the ICW to Sunset Bay Marina.